Although the average home stager earns between $75-$150 per hour., this is business is not about getting rich quick. It takes a lot of commitment, hard work and drive. Entrepreneurial- A successful home stager markets themselves to the community, takes initiative to establish relationships with agents, and continues to put effort into their business everyday- even if the phone isn’t ringing. 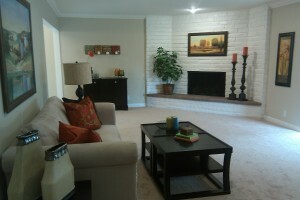 Hard working- Staging home entails a lot of rearranging of furniture and accessories. This involves a lot of lifting, bending, carrying, and long hours of hard work. Ethical and Empathy for others- Word travels quickly in the real estate community. Unethical practices, unkind words or a battling attitude may earn you a bad reputation. People own possessions that are sentimental to them in nature and we must always honor their lifestyles and belongings. Follow through- Maintaining your current clients saves you time and money over attracting new clients. This means follow-up phone calls, monthly newsletters and regular agent presentations. Love What You Do-When you love what you do it will naturally inspire you to be working diligently on your business. In addition, you will be a better designers, better business manager and more businesses will come your way when people feel your passion.